On Saturday (2nd January) I had volunteered to do token sorting, and after a day of rest (well, travelling home from Spain) I was itching to get out there. I had not been running fast, but I had kept my running up during the holidays. I put in 27.30 in a pace calculator as an optimal time (to make a course pb with a bit of leeway) and it said 8.52 per mile. Miles with an 8 at the start sound way too fast for me, but actually I know I am capable of it now (in fact, on Tuesday on the club run we did a 4 and a bit mile run, and the last 3 miles began with 8). I could not remember my exact Brighton 10K time, but I knew it was under 55 minutes, so I put in 55 for a 10K, and it came up with 8.52 per mile. So this is interesting to me. Firstly, it reiterates that I am not a sprinter! I much prefer to get into a race. I can tolerate some discomfort because that speed over a 10K is way faster than my normal running, but I just can’t tolerate that feeling sick feeling for very long in a 5k. Jess mentioned something similar in one of her posts, about not being able to move her legs faster, but having some energy left at the end of a 5K. Anyway, I was going to give it a shot (for a course pb and not an overall parkrun, as there are far flatter courses), but I had my sore hip thing in the night (I managed all of 2015 without it being an issue and it came back-grr) and it had been pouring with rain so it was going to be boggy. 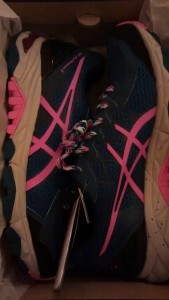 My new trail shoes had arrived! Love them! 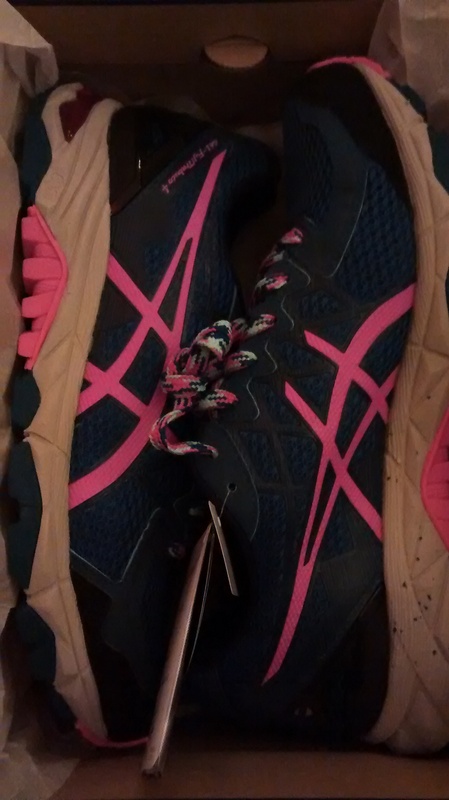 Although I got them from SportsShoes.com (normally good service) but I was sent an email that said “free delivery if you spend over £75”, so I added a few bits (another Light Spur and a headband) to push it over, but it wasn’t free. I have emailed them, and they claim that the offer ran out the day before I placed my order, but there was no date in the email, and I have even sent the entire email back to them for them to tell me where it says that, and they can’t. So I am a bit annoyed. (Today I finally received an email saying that the postage would be refunded because they could see there was no date in the email- I know it’s not much but it’s the principle of it that annoyed me so much). I had set my alarm a bit earlier as I thought I would try some food first, so I had a nakd bar (they worked for me in Spain), and I did some warm ups at home before my dad picked me up. One glance at the footpath and I knew it was silly to attempt a pb (I would need spikes and not trail shoes), but I have been aiming for under 30 minutes, and decided to try to be faster in the middle mile, as that is often my slowest (even though it has the most downhill). The start ended up being really congested and I had to stop for a bit. Plus the big puddles meant that sometimes the person in front would stop to avoid a puddle, and then that would mean you would have to stop too, to avoid bumping into them. But once everyone thinned out a a bit I tried to push a bit harder. Then came the mud! Normally it is muddy, but not too bad, and mainly in the final mile. This time the middle mile (on a grassy field) was so slippery and slick- it was hard to grip the ground and at times my trainers were nearly sucked off my feet! It had held 4 parkruns over 8 days, so no wonder it was bad- it needs a break now! The final mile was again very slippery and I ended up wading through a few huge puddles as I didn’t want to waste time stopping and inching around the edge- plus my feet were wet through by that time. My new shoes at the end! The laces aren’t too bad as they have a little pouch in the tongue to tuck the laces into. Anyway, my final time was 29.05, so under the 30 minutes but not close to a pb! I think I need the mud to dry out a bit before I attempt it. The nakd bar was good though- I didn’t get hunger pangs and although I got a little stitch near the end that could have been from anything. Strava says I got a pb for a section in the middle, plus my second mile was 8.45, so I am sure I can work towards that this year. After we finished, we put on our coats and then started the token sorting (as I had volunteered, and my dad of course agreed to help). I have never done this job before, but luckily the team had a sort of tool box with sections for 20 tokens (1-20, 21-40 etc), so we sorted them into the sections before ordering each section. What was strange was that for ages we had a token missing from the first section- they must have been one of the last to be scanned (probably waiting for someone else running)- I thought they would be more in order than they ended up being. Even though I had my coat on (and a jumper) I got really cold, and I was glad it wasn’t raining. We were finished by just after 10am, so we were sorting for a good half an hour. It was quite a long job even with two of us, and really opened my eyes even more to how hard the core teams work each week to do all of these things. After Dad dropped me home, I had a shower and then we headed around to my parents as my mum was cooking us pancakes! Parkrun + pancakes= an awesome Saturday, I think you will all agree! So the aim for 2016 is to chip away at that parkrun time a bit. I don’t do resolutions, but I like things to aim for. I am trying to volunteer a bit more- around once a month, and in fact that would mean I would earn my volunteer t-shirt this year. There is a new one starting up near me, which will be much flatter, so potentially I could go quite a bit faster, but I would still like to bring my course pb down a bit this year too. I think sub 30 on that kind of terrain is great! 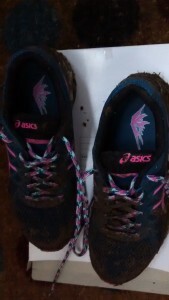 When I ran a mixed/muddy terrain 10km (just for fun) a few weeks back I was dead on 60mins when previously I was around 53/54mins – Mud makes a big difference. Pre: Park Run I find that half a nakd bar or oatie bar with some nut butter works really well..
Hope you get the postage back soon – That’s the sort of thing that winds me up sooooo much, it’s not a big thing but like you say the principle.. They did send it back to me as I think someone a big higher up got in contact! I wasn’t asking for much, it just annoyed me! Yeah, I think I should aim for the nakd bar maybe as it probably did help. Non-sprinters unite! I’m a lot better at turning my legs over now that I run at a lower mileage and don’t exist on junk miles, but I still find 5Ks in particular extremely taxing in terms of literally giving it your all until you can’t carry on at the end. My recent virtual 10K though…well, that was a different matter! I was completely drained by the end of that and could only just manage a recovery jog home. Your 2016 goal sounds brilliant. I’m sure you will indeed chip away at all of your course PBs. I say ‘all’ because I bet you’ll get progressively faster on the new Parkrun too, once you’ve had a bit of time to evaluate the course profile and get used to the terrain. You did so well on your virtual 10k time- brilliant stuff! That is really frustrating about SportsDirect. I would feel exactly the same. I find the company quite low in customer service and all the stuff in the news about the way they treat their staff just further makes me dislike them more. Well done on your time! With the weather and the terrain lately it’s so hard to get a decent speedy attempt in. I’m with you about not enjoying that painful sprinting feeling. Every single week I have the same argument with myself at parkrun “try and push it this week… nahh just take it easy”. And I end up somewhere in the middle. Like you, it takes me time to warm-up and get into the flow. Perhaps I should do more of a warm-up than my half mile jog, but with helping set-up I don’t have the time as by the time we’ve set the course up it’s about 8.40am and I need to go to the loo and then it’s the briefing. To be honest though, I’m not that bothered. I like to feel I’ve put some effort it but my times don’t really have much consequence with me as I know I’m a bit out of shape and the course is just rubbish for any real speedy attempt. Oh no sorry, it’s sportsshoes.com, not sports direct. I think that, not too bothered in the end as I just enjoy doing it. I just feel like as I got a pb in all other distances I should really try. How annoying about the postage on your trainers. Glad they refunded you eventually though. You would think their marketing team would have done a better job at the advertising. I went to order a new pair of trainers from them last week actually but was put off by the postage not being free. If I’m spending somewhere in the region of £80 for trainers I don’t expect to have to pay delivery on top of that! You have a similar goal as me for parkrun. I’ve loosely said that I would like to work towards a sub 26min parkrun, but really I just want to chip away at the time and see how consistent my pacing can be. Yes I checked and checked but there was no small print with dates at all. I agree- that is a lot to spend and most places would always have free delivery over £50 ish anyway. I think we are fairly similar runners (apart from your ultra distances and many marathons)- it’s hard to adjust your thoughts sometimes though.